May 8 — The Judgment Day for Armenia? Home / Armenia / Caucasus / Democracy / Featured / News / Protests / May 8 — The Judgment Day for Armenia? After weeks of mass street protests, arrests and the resignation of the prime minister — Serzh Sargsyan, Armenia's on the brink of ushering in a new leader. The political optics of Sargsyan taking advantage of constitutional changes to move from his position as president to a new, more powerful role as prime minister sparked 11 days of street protests that ended up pushing Sargsyan to resign. Moscow, which normally views mass protests in neighboring countries as a direct threat, has been unusually restrained and says the political crisis is a domestic Armenian issue. Though Armenia spent two decades after the breakup of the Soviet Union on a westward path, Sargsyan, a Republican, secured closer trade and political ties to Moscow. Do note, the members of Republican Party of Armenia (Hayastani Hanrapetakan Kusaktsutyun, HHK) have dominated Armenian politics since 1999. Also, Sargsyan has been in power either as President or Prime Minister since March 2007. He even amended the country’s constitution to remove a clause that would limit the number of terms he could be in power. He allowed Russia to extend its military presence in Armenia and joined Russian President Vladimir Putin's Eurasian Economic Union (EEU). However, not so long ago, Nikol Pashinyan, a leader of the Armenian protests (who became the sole candidate after the deadline passed without any others registering), stated that Armenia's membership in Russia-led EEU poses a threat to the national security of the country. But, again, it's not guaranteed Pashinyan will become prime minister. As it was expected, the National Assembly (Azgayin Zhoghov) sought to halt his bid. The voting was conducted on May 1 and Pashinyan was to be elected as Prime Minister. He needed 53 votes, which included six votes from the HHK. But the ruling party voted overwhelmingly against Pashinyan’s candidacy, even though he was the only candidate to be in the field. This led to a large protest on May 2 where highways and streets were blocked across the nation, with laborers striking work. At Republic Square in Yerevan, the country’s capital, around 150,000 people gathered to listen to Pashinyan speak. Another round of voting was announced and it will be held on May 8, i.e., tomorrow. Last week, Vahram Baghdasaryan, the head of the HHK in parliament, told Reuters that his party would support anyone on May 8, including Pashinyan, if they enjoyed the backing of one-third of lawmakers. 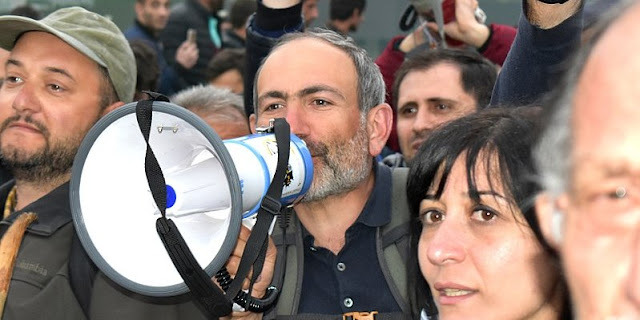 Pashinyan, in his Republic Square address, said that he had been informed of the ruling party’s support for his candidacy for the May 8 vote. Baghdasaryan's announcement also came minutes after opposition parties announced that Pashinyan had secured the support of the minimum 35 lawmakers needed to be nominated as a candidate in the May 8 vote. The Tsarukian Alliance (Bargavatch Hayastan kusaktsut’yun, BHK), with 31 seats in parliament, announced that it would support Pashinyan’s nomination. Together with Pashinyan’s Yelk ("Way Out") faction, which has nine seats, that gives him support from more than one-third of the legislature. However, as per Armenia's constitution, if a prime minister is not elected in the second vote on May 8, parliament will be dissolved and early general elections would be held with the HHK-led acting government in charge of the electoral process.